As all of you might know by now, “Lync Server” or the brand name “Lync” is going away and it’s successor is called “Skype for Business”. Despite the change of well known and adored product name, Skype for Business is set to achieve higher goals in UC world while keeping Microsoft’s “Mobile first, Cloud first” strategy alive. As the name suggests, it’s a mixture of great features and functionalists between Skype and Lync put together to become the ultimate collaboration platform in unified communications space. 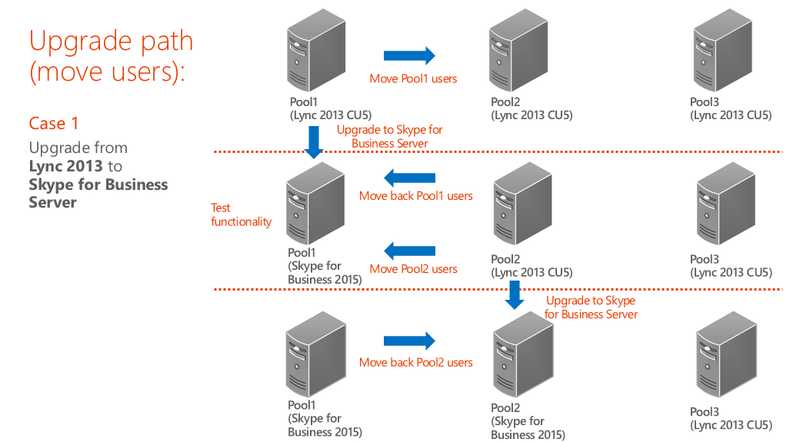 In Lync Server 2013 paired pool scenario, It recommended that to move the users in to the other pool and upgrade the base pool to Skype for Business Server. 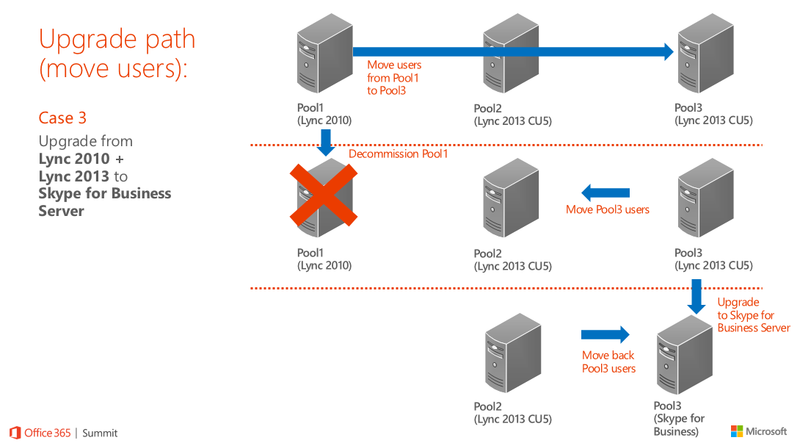 Once done, move the users back to the base pool and then upgrade the paired pool to Skype for Business Server. In a pool paired situation, both the pools must be upgraded one after another assuring the time both pools spend in different versions to the minimum. The other option is to upgrade the existing Lync server 2010 platform to Lync server 2013 employing Side-By side upgrade methodology and then, In-Place upgrade the Lync server 2013 pool to Skype for Business server. I cannot work out such reason to follow this path other than upgrading the Lync server 2010 platform to Skype For Business server. This process require a significant downtime and time consuming. 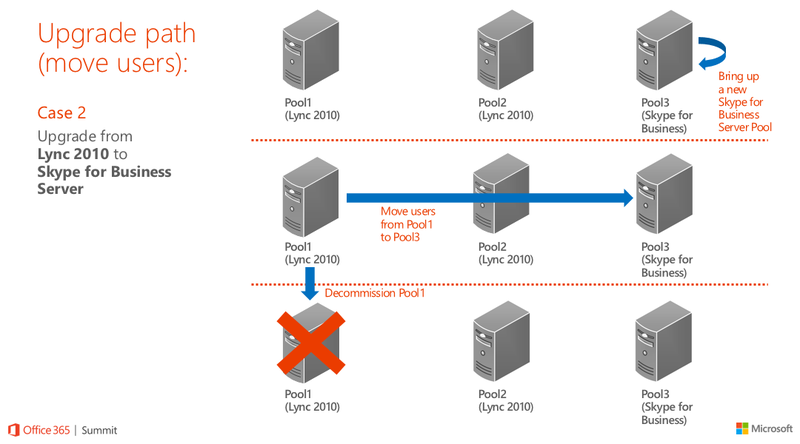 Moving in to the roles and services that supports In-Place Upgrade process within Lync server 2013 platform includes the Front end pools, Director pools and Edge pools. The Survivable Branch Appliances (SBA) appliances are not supported for In-Place Upgrade. This is something that the appliance providers should include in to the device (S4B Image) so that it can be configured with the Skype for Business Front end server pool. Survivable Branch Server (SBS) is supported for In-Place Upgrade. For the SQL back end supportability for enterprise pools, the existing back end pools will get updated by running the Update-CsDatabase command in the process of publishing the topology. In the process of running the deployment wizard in Front end servers, the local SQL express copy of SQL 2012 will upgraded in to SQL 2014. Below is the table that highlights overall SQL version compatibility within the migration process. 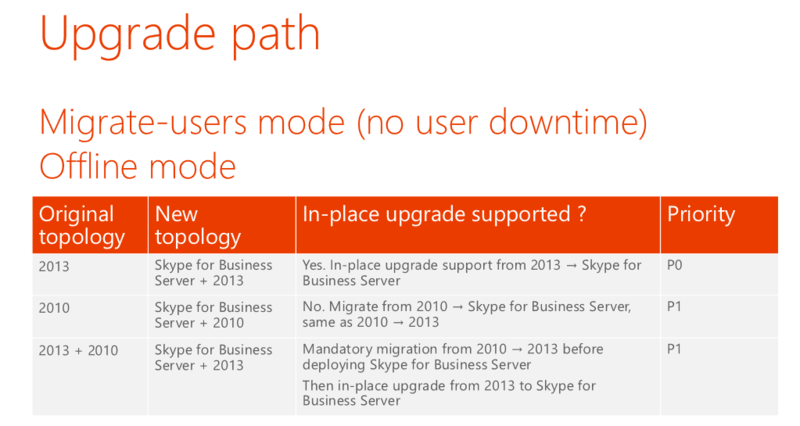 This wraps up the upgrade consideration and recommendations when moving Lync Lync server platform to Skype for Business platform. The contents of this post are in courtesy of O365 Summit.